Is a movement calling for the death penalty in Bangladesh serving democracy and justice, or is it just a lynch mob? A major street intersection in Bangladesh’s capital, overflowing with people young and old, putting on performances, making speeches and holding candlelight vigils. A generation galvanized and mobilized, newly aware of their voice and place in society. It sounds like the beginnings of change in yet another country, something to be celebrated, supported and encouraged. But what if these peaceful protests are not seeking democracy and participation, but demanding violent punishment for enemies? Should a people-powered movement braying for blood get what it wants? Shahbag, situated in a major neighborhood in Dhaka, has been renamed Shahbag Square after Egypt’s Tahrir Square. 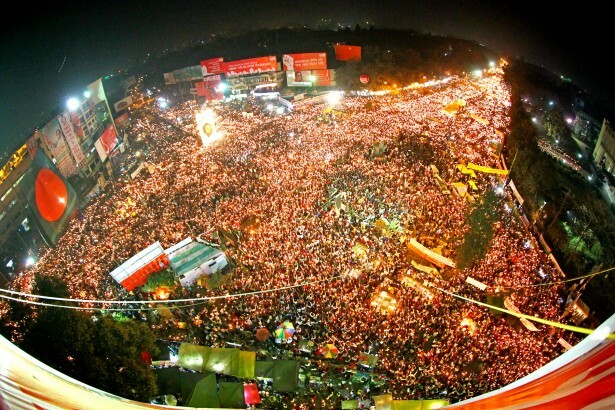 Unlike Tahrir Square, though, the protesters at Shahbag are not looking to topple a dictatorship. Instead, the people at Shahbag are demanding death sentences for convicted war criminals of the 1971 Bangladesh Liberation War. Bangladesh — which used to be known as East Pakistan — fought for independence against the Islamic Republic of Pakistan in 1971, a conflict that has been remembered as one of the most violent wars of the 20th century. Over four decades later, Bangladeshis finally expected to see justice served by the International Crimes Tribunal. Yet when Abdul Quader Mollah — a Razakar dubbed the “Butcher of Mirpur” — was convicted on February 5 of five out of the six charges against him, people were stunned when he was sentenced to life in prison rather than death. Seeing the punishment as too lenient, protesters began to gather at the Shahbag intersection. They took to Facebook and Twitter, encouraging their fellow countrymen to join them. Bangladeshis answered; the first week of the protest was the biggest mass demonstration in the country in 20 years. The protests that began at Shahbag Square spread to other parts of the country. Activities have been going on for more than two months, with no sign of things being resolved any time soon. On top of calling for the death penalty for war criminals, the demands of Shahbag have widened to include the ban of Jamaat-e-Islami, a political party that has been accused of collaborating with the Pakistan Army during the war, and the secularization of Bangladeshi politics. (Abdul Quader Mollah is the assistant secretary-general of the party.) Protesters have also vowed to boycott all Jamaat institutions such as Islami Bank and mass media outlets like Diganta Television and The Daily Sangram. Shahbag Square may have galvanized the nation, but comparisons to the protests in Egypt and Tunisia may be misguided. While their means may be generally nonviolent, questions have been raised about the violence inherent in their demands. Is a movement calling for the death penalty serving democracy and justice, or is it just a lynch mob? The government has already begun to give in to the protesters. The Bangladesh Parliament has amended a law that would allow the state to appeal the verdicts of war crimes trials should they appear to be inadequate. In fact, as time goes on it appears that things are beginning to spiral out of control. Violence has broken out in parts of the country as animosity grows between the protesters and those who see them as seeking to undermine the influence of Islam in Bangladesh, leading to deaths and injuries throughout the country. Homemade bombs have been hurled at protesters. Jamaat-e-Islami has also been accused of inciting violence, attacking Hindu temples and burning down property. The call to ban Jamaat-e-Islami has also sparked other reactions. Hefazat-e-Islam, an Islamist group with the backing of Jamaat-e-Islami, has staged counter-protests against outspoken bloggers involved in Shahbag. Their protest has called for the introduction of anti-blasphemy laws in Bangladesh that would go as far as sentencing bloggers “who insult Islam” to death. There are plenty of issues behind Shahbag. There are questions of whether a movement whose major aim is to call for the death penalty is one to be encouraged. The political maneuvering of different parties in Bangladesh is also something to keep an eye on, as the movement is already showing signs of having been hijacked for political purposes. As the consequences of Shahbag continue to unfold, it becomes less and less certain that this people-powered movement will lead to more accountability and justice in Bangladesh. Andrew Lindsey Democracy isn’t about making the right choice; it’s about making the most popular choice. Aus Dyer Wrong. Democracy is not just about making the most popular choice, it’s also about freedom of information, education, basic needs, support, and generally allowing people to grow up able to understand what’s going on enough to make educated decisions, not just a pack of lunatics trying to murder people via a vote. Kirsten Han Exactly. A democratic society is not just about what the majority says; there are basic rights that need to be respected. We cannot just discount these rights just because a majority demands it. Adam Vogal A republic is run by the rule of law wherein everyone is equally protected. Rich or poor have the same freedoms guaranteed by law. Far better to live in a republic than a democracy in my opinion.